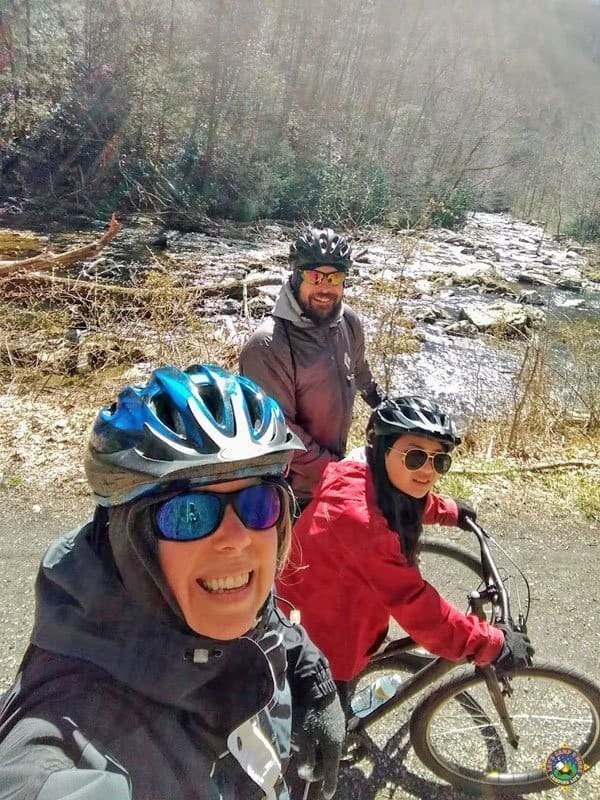 Read all about our Virginia Creeper Trail Bike Rental Adventure! Do you like to ride bikes? How about riding your bike for 17 miles? That sounds like a long distance, but I assure you that it is easy. 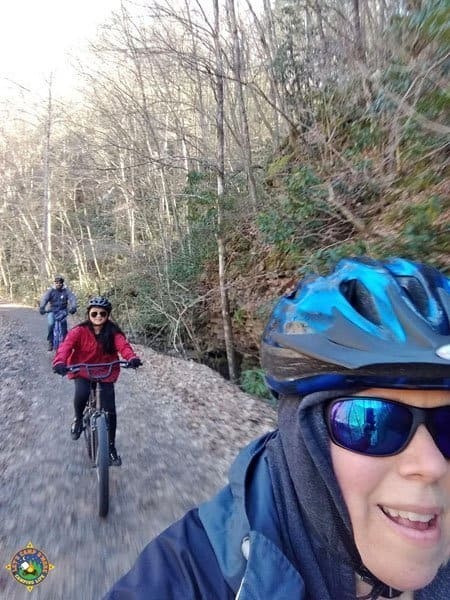 The Virginia Creeper Trail, which is located in Southwest Virginia, is a 34-mile rail to trail path running from Whitetop Station to Abingdon. The most popular part of that path is the portion that goes from Whitetop, which has an elevation of 3500 feet to Damascus, Virginia which is about 1900 feet. That means you get to ride downhill for 17 miles. 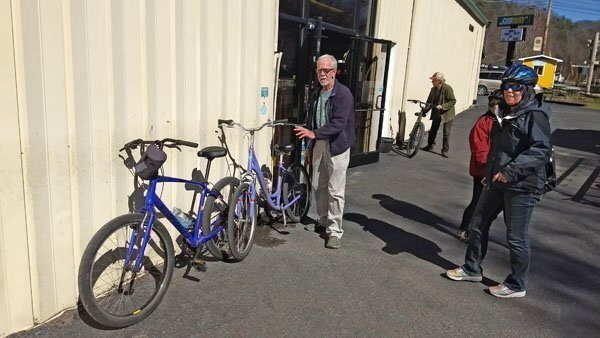 We started our adventure at Sun Dog – Adventure Damascus, which is one of seven bicycle rental outfitters in the town of approximately 800 people. This small town supports all these shops because it is the crossroad of the Virginia Creeper Trail and the Appalachian Trail. Sun Dog also is a gear and provisions cache location for the AT hikers on their way from Georgia to Maine. 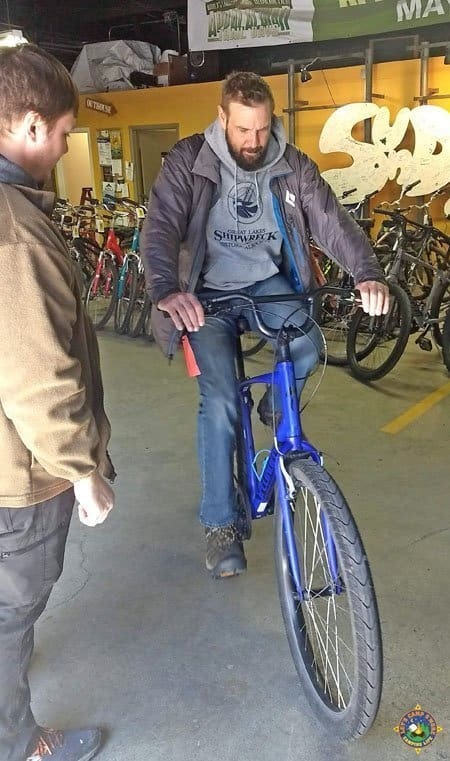 After paying for your Virginia Creeper Trail bike rentals, your party gets fitted with bicycles. A complimentary bottle of water is added to the water bottle cage on the bike. 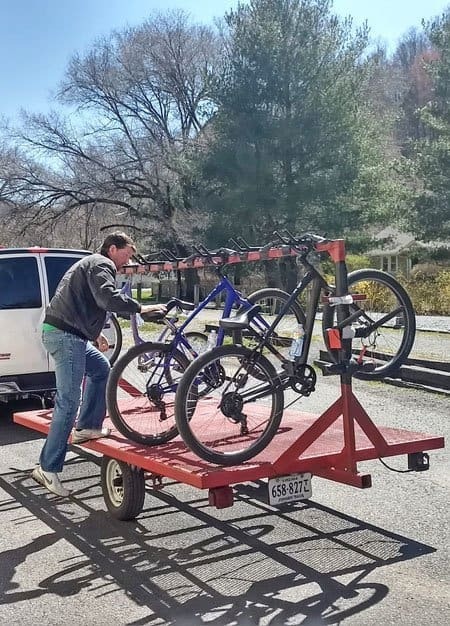 The bicycles are loaded onto a bike trailer that is pulled by a shuttle van. 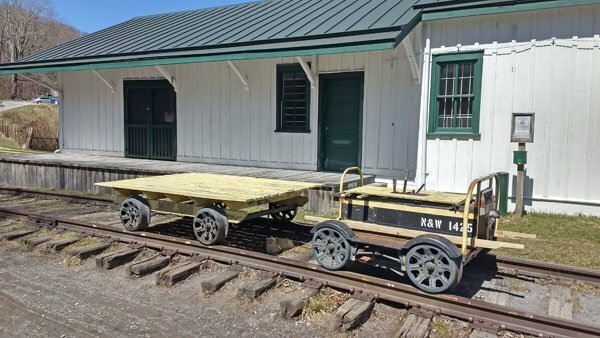 You can just pay for the Virginia Creeper Trail bike shuttle to transport your own bike too. The shuttle ride from Damascus to Whitetop Station takes about 40 minutes. Our driver, Eric, told us a lot about the trail and the area. You can get the details of the trail from our interview with him on YouTube. We were fascinated to learn that up to 45 vanloads of bikers are taken to the top per hour during peak season. It was not very busy the day we rode in late March. There are 49 wooden trestle bridges along the trail of varying lengths. We crossed 20 on our downhill ride. 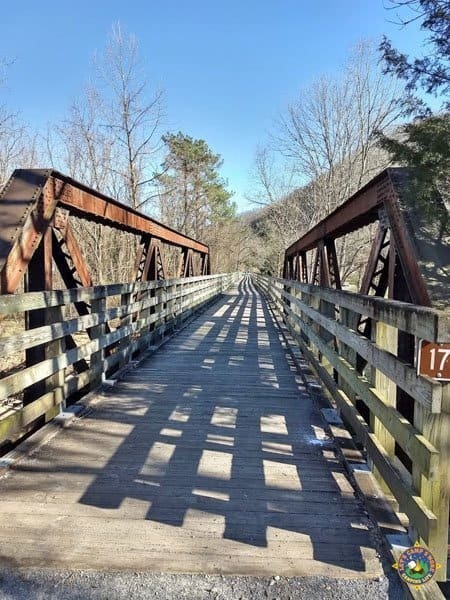 The Virginia Creeper Trail begins in Abingdon, so the trestles are in descending order as you make your way down the trail. 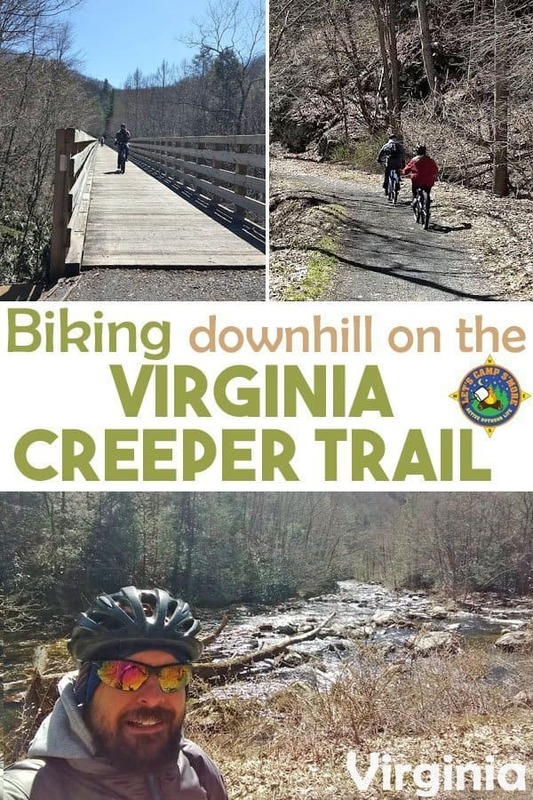 Learn more about the start of the Virginia Creeper Trail on our interview with Amanda of Visit Abingdon VA. There are several interesting stops along the trail. Green Cover has an old station with a museum shop, which is a pristine representation of how it was the day it closed. There are bathrooms located along the trail, in addition to many scenic places to stop. There is a restaurant in Taylor’s Valley, which is where we took a rest and ate snacks along the stream. After 2 hours of easy riding with multiple stops, we made it back to Damascus. We must have been riding fast because it normally takes 2.5 to 3 hours. When we got back to Sun Dog, two friendly employees who had some tales of growing up in the area greeted us. There are many interesting people and interesting stories in this town. After the ride, we crossed the street to eat at the 7 Trails Grill. We started our dinner with Griddle Cakes, which were very tasty. 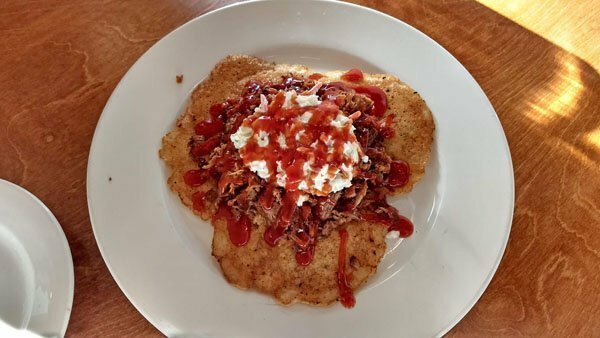 This appetizer is a must order! I was very excited to find out they serve tater tots, which are one of my favorite things to eat. 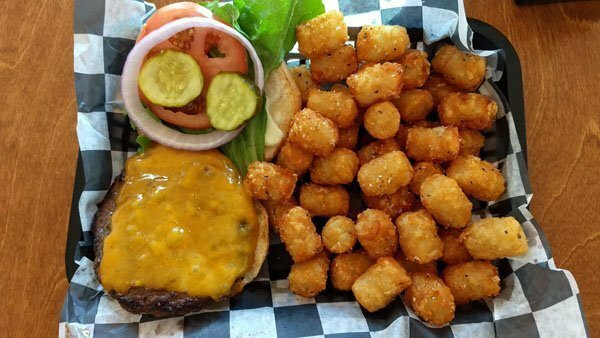 I had my tots with a cheeseburger. The friendly staff at 7 Trails provide great service! 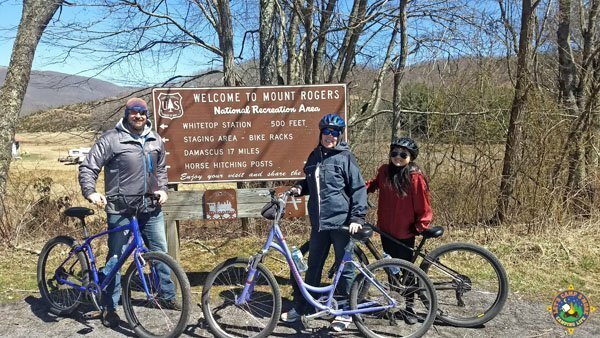 We had a great time on our Virginia Creeper Trail bike rental ride. It is easy to see why it is on the Rail-Trail Hall of Fame. We will definitely be returning to the area so that I can ride all the way up and down the entire 34-mile trail. While the VCT Bike Rental & Shuttle and dinner were provided to us, the opinions in this post are our own.